Fortis nailed the color blue on this watch. So if blue is not your color, move on because this marine chronograph watch is all about that color. This watch utilizes 3 subdials: a 30 minute counter at 12, a 12 hour register at 6, and a constant seconds dial at 9. The hands of both chronograph related subdials, as well as the central chronograph hand, are painted blue for easy identification. Unlike most marine watches, the bezel of the Fortis Aquatis Marinemaster Blue Chronograph features large knurled lunettes which offer an easy to grip surface - even when using diving gloves. This watch also sports a matte black dial with large blue Arabic numerals, giving this piece supreme readability. The watch also utilizes white sword style hour and minute hands and a second hand complete with luminous pip for increased legibility. 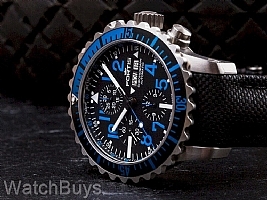 The Fortis Aquatis Marinemaster Blue Chronograph is fitted in a satin finished case and screwed case back. The large crown is designed for ease of use and is finished with an engraved Fortis logo. This watch is fitted with a black Fortis Perormance Series strap. 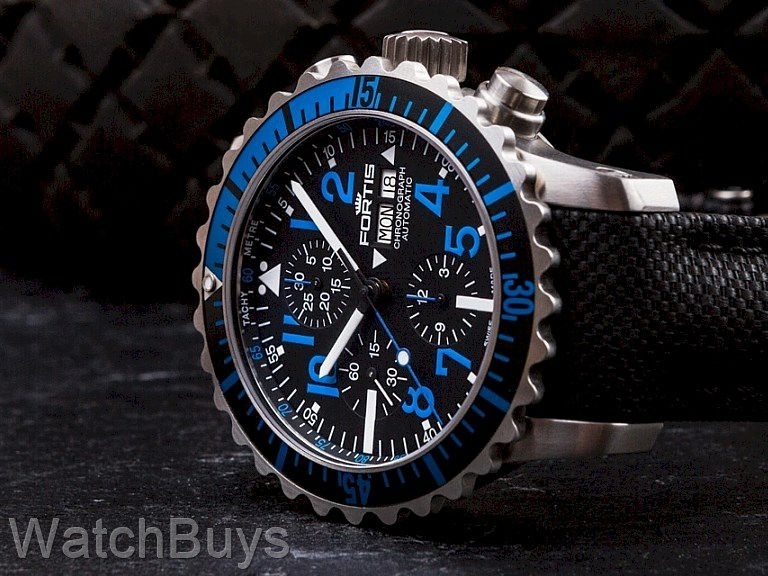 Verified Owner Comments: For anyone looking for a tough, practical, rugged, reliable & stylish watch the Fortis Aquatics Marine master Blue Chronograph may be exactly what you need! Aesthetically, the watch is well balanced.........neither too large or small in design. The watch face & numerals are legible day or night. And it's a pleasure to wear & use on a daily basis! I'm very happy 😊 with my purchase having owned it for a month now.